Reliance Properties has dropped its earlier proposal for an eight-storey condominium project at the Northern Junk site and on City lands in favour of a six-storey (five from Wharf Street) rental building solely on the Northern Junk lands. The design has not yet been released. The discussion on the condominium proposal can be found here. An artist's rendering of Reliance Properties' sixth design revision of the Johnson Street Gateway project on Wharf Street at Johnson Street. The eight-storey building depicted in the photo above has been nixed in favour of a shorter and smaller as yet-unreleased design on a significantly smaller development site. 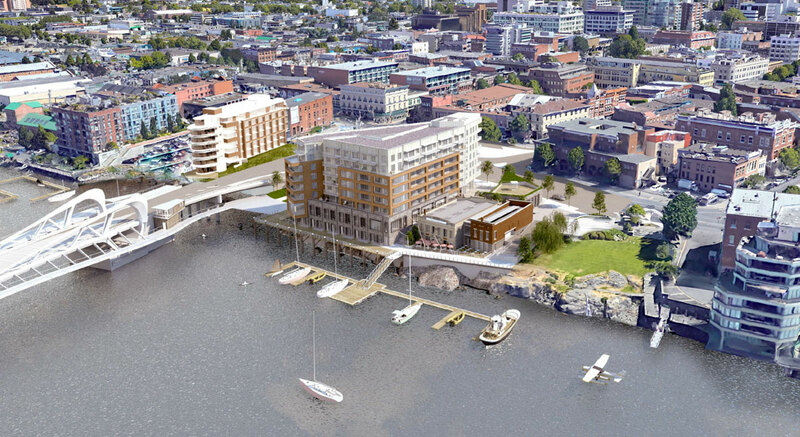 The City of Victoria’s about-face over the sale of excess Johnson Street Bridge lands has forced a decade-long harbourfront development proposal to drastically alter its design and scope, Citified has learned. Sources at the City of Victoria tell Citified that Reliance Properties’ plans for Johnson Street Gateway, a mixed-use condominium and retail project that would simultaneously restore the historic Northern Junk buildings at 1314-1324 Wharf Street, have been shelved in favour of a purpose-built rental complex with fewer floors, a significant reduction in residences and zero on-site parking. Since 2010, Vancouver-based Reliance Properties – the firm which restored the historic Janion Hotel and built its oceanfront addition overlooking the northwest corner of the new Johnson Street Bridge – has been pursuing municipal approvals for a mid-rise project that from the outset was expected to absorb excess City-owned land made available through a re-alignment of the bridge’s eastern approaches. Also what's happening with this thread? The one with all the history on this project? I just checked my calendar to make sure today wasn't April Fool's Day. Do we not get a rendering yet? that's an awful lot of units still for zero parking stalls. i imagine they could likely rent them by the month (30+ days) to tourists though for a good $$$. $2500 to $3500 in summer a bit less in the off-season. Edited by Victoria Watcher, 09 April 2019 - 12:07 PM. ...i imagine they could likely rent them by the month (30+ days) to tourists though for a good $$$. $2500 to $3500 in summer a bit less in the off-season. Something tells me that option would not sit well with this council. Does this property currently have transient zoning? That's more-or-less what I assumed. I suppose Council will also insist this prime waterfront property must be "affordable" rentals. 30+ days is just regular rental zoning though. not required transient. the best western on quebec street does winter long-stays for $2500 and up per month ($2900 and up for feb/mar/apr). so there is money to be made on 30+ days all year esp. on the harbour. Edited by Victoria Watcher, 09 April 2019 - 12:59 PM. ...there is money to be made on 30+ days all year esp. on the harbour. I don't disagree, but if this is how the applicant hopes to get CoV buy-in it ain't gonna fly. well i don't think that's what he will say. but if you are going to get a premium for them when they have no parking i can't see another good way to do it. neither the property purchase price nor the property taxes are going to be low. janion sold well with no parking precisely because they can be rented nightly. Edited by Victoria Watcher, 09 April 2019 - 01:12 PM. 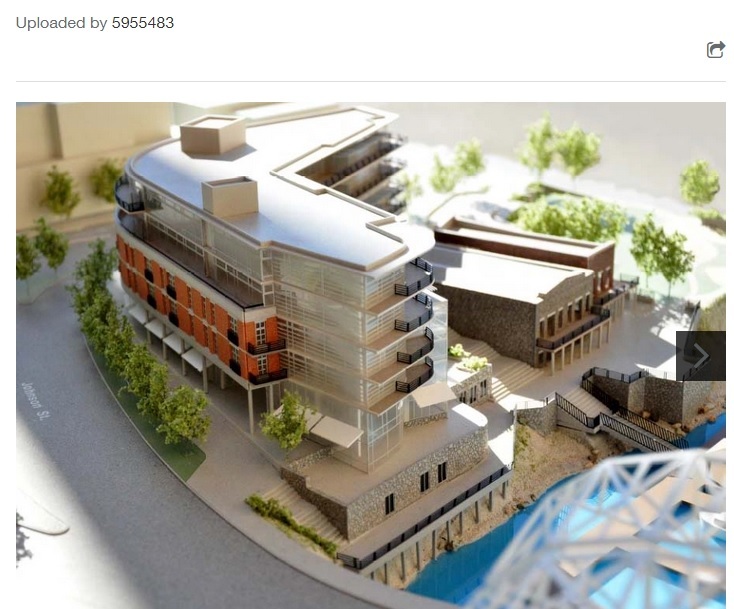 You think this council cares whether or not the developer can make a profit on this project? Did somebody get a spy shot of the model? Edited by aastra, 09 April 2019 - 02:38 PM. Any chance you can post the image here aastra? The photobucket link isn't working for me. I think that’s redesign 3 or 4? The rental is redesign 7. Just kidding around. That was the very first version going back ~10 years ago. I took that picture and all I remember is that it was very early and was a Paul Meŕrick design. Soon after everything went off the rails. Surely this project owns the local record for the most high-quality revisions without closure? The most high-quality AND diverse revisions, I should probably say. So much good and interesting stuff right down the toilet.